Set of 10 gold plated bolts, nuts and washers. Use in place of riveting. They measure 7mm from top to bottom. The pin measures 1.5mm in diameter, approximately 15 gauge. The outer diameter of the nut and the top of the bolt is 2.5mm. Bolt fits in a 1.5mm or larger hole. You'll need a set of hex wrenches to use these mini nuts and bolts. Trim excess bolt length with a heavy duty cutter. 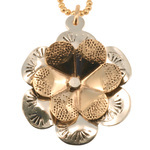 These mini nuts and bolts are used in our FREE: Folded Flower Pendant online class.